It's time I confess... I think I'm addicted to jumpsuits! I was cruising through this little online boutique called Mission Lane when I found this drool worthy jumpsuit. Normally I avoid cropped wide-leg bottoms of any kind because my bowed legs can appear as parentheses or commas (yes one backwards) but I couldn't pass this baby up. I'm also hesitant about ordering from these little shops but I appreciate Mission Lane. They're about giving back and even offer a scholarship so why not purchase with a cause in mind? So sweet! Back to the jumpsuit at hand! It's texture is rich and altogether well made. This look can easily go from desk to dinner. Simply add a blazer for work then add a pop of colorful accessories and expose that cutout on the dance floor. Y'all know I love a good backsposure! (Yes, I made that up, as usual. Clearly I should have my own dictionary, lol) The only thing that makes me sad is the lack of pockets but otherwise, it's amazing. So! 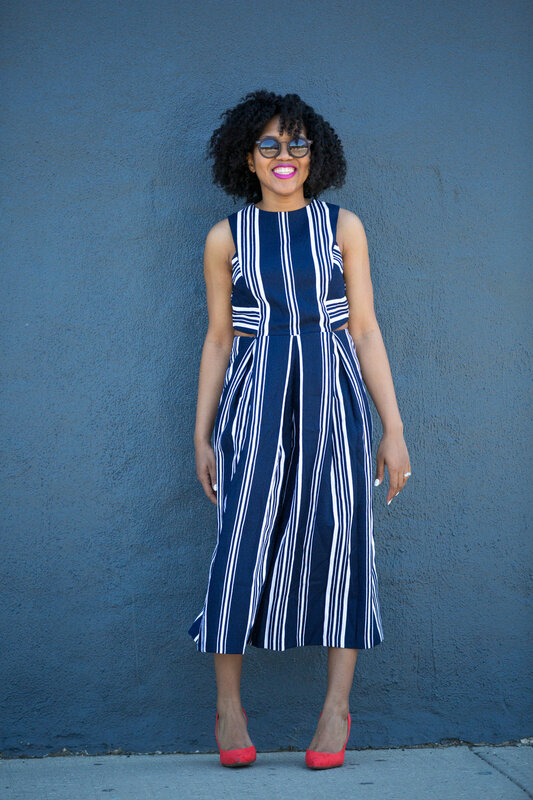 Are you jumping for this jumpsuit? Let me know in the comments below. I'd love to see how you'd wear it! Let me know if you get it and tag me in your pics on Instagram. NEW! Lips: Black Radiance "Hollywood Glam"
NEW! Nail Polish: Essie "Blanc"